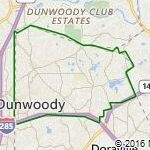 Dunwoody is a city located in DeKalb County, Georgia, United States. It is a northern suburb of Atlanta. Dunwoody became incorporated as a city on December 1, 2008. As of the 2010 Census, the city had a population of 46,267. As of 2015 the population in Dunwoody is 48,0733. The median home value of residences is $403,700. Home values continue to appreciate in Dunwoody. Some homes have appreciated upwards of 6.2% over the past 2-5 years.